Senhai has achieved great development with the talented leadership and constantly diligent teams. Senhai’s products are popular in many countries and districts like Southeast Asia, Mid-East, Europe, America, Australia, South America, Africa, etc. Hebei Senhai Pipeline Co., Ltd. is one professional manufacturer of ERW, SAW and SMLS steel pipes, as per standards of API5L, API 5CT, ASTM, EN, BS, DIN, GOST, GB, etc. Senhai Pipeline is located in Cangzhou City, which is the famous "Hometown of Pipes and Fittings" in China, about 120km away from Tianjin Seaport and Airport, and 180km from capital Beijing. Senhai especially produces welded steel pipes of large diameter and thick wall thickness in ERW, LSAW and SSAW. Anti-corrosion layers can also be done in our factory. 3) SSAW Spiral Steel pipes: OD φ219mm~φ3620mm(8'' ~ 144''); WT: 6mm~25mm; Length: 5.8m~12m. 4) Anti-corrosion steel pipes: with layers of 3PE, 3PP, FBE, hot dipped galvanized, Anti-drag coating, polyurethane insulating, epoxy lining, cement-mortar layer, etc. 6) Pipe fittings in CS, AS and SS, with size 1/2'' ~ 72'' for BW fittings, WT SCH10 ~XXS; and size 1/2''~4'' for fittings in SW and THRD. 7) Forged flanges including WN, SO, SW, BL, THRD, LJ, spectacle, orifice, etc. with size 1/2''~48''. Materials include A106 Gr.B, A53 Gr.B, API 5L PSL1 PSL2 X42~X70 L245 L290 L360, Q235A, Q235B, Q235C, Q345B~F, 10#, 20#, 45# steel, A105, WPB, etc., all of which meet the standards of ASTM, API, BS, DIN, JIS, EN, GOST, GB, etc. following standards including ISO9002、ASTM A234 GR WPB ASME/ANSI B16.9、DIN2605-1/2 2615 2617, JISB2311 2312, EN10253-1/2/3, GOST 17375 17376 17378 17379 GOST 30753, etc. 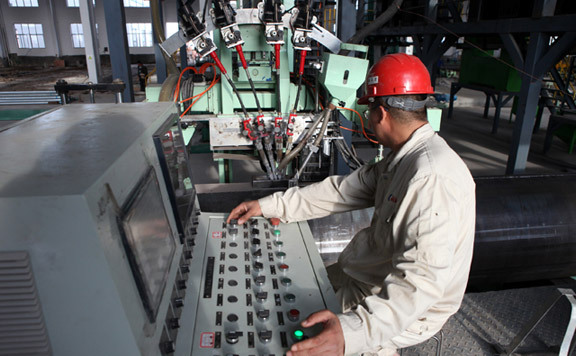 Occupying total area of 33,000 square meters, Senhai possesses workshops of four hot rolling production lines, two cold drawing production lines, four welded pipe production lines and office building. 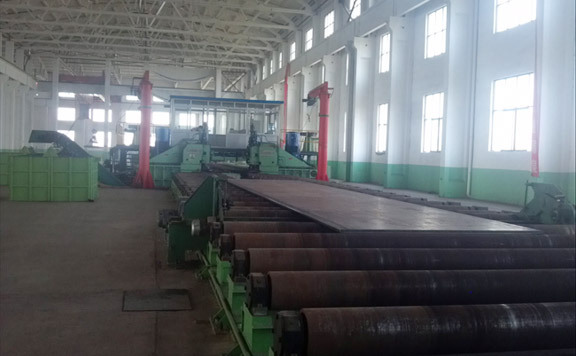 The major production equipment owned by Senhai cover the hot-rolling puncher, interactive double core bar cold drawing machine, automatically rotary head rolling machine, tube straightening machine, annealing furnace without water cooling system and auxiliary equipment of surface scouring and coating. Equipped with eddy current flaw detector and ultrasonic flaw detection equipment suitable for seamless and welded steel tubes of various pressures The physical and chemical laboratory of Senhai is qualified to undertake different types of testing and inspecting of steel tubes with its advanced inspection measures, the inspection procedures meet all professional requirements. Our company is equipped with complete sets of pipe fitting production lines and advanced fabrication equipment such as cold forming, hot extrusion, mechanical processing, heat treatment, etc., With such inspection equipment and technologies as chemical and metallographic analysis, physical test and nondestructive test, Senhai enjoys a highly strong technological power. Senhai services industries like oil and petroleum, power, chemical, petrochemical, pharmaceutical, refinery, boiler, heating, shipbuilding and construction, etc. in domestic and abroad. Senhai has achieved great development with the talented leadership and constantly diligent teams. Senhai's products are popular in many countries and districts like Southeast Asia, Mid-East, Europe, America, Australia, South America, Africa, etc. "Customer's satisfaction, highly-qualified products and outstanding services" are treasured by Senhai as the business principle. We sincerely expect customers both domestic and abroad to contact us and work together to build a brighter future!